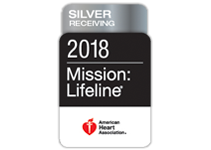 *The American Heart Association and American Stroke Association recognize hospitals for success in using Get With The Guidelines to improve quality of care for heart disease and stroke patients. Gold hospitals follow treatment guidelines in certain key measures at least 85 percent of the time and have maintained this performance level for consecutive twelve month intervals. The Plus awards represent a current gold or silver award and additional 75 percent compliance with module specific quality measures for at least twelve consecutive months.